The Baptism of a child is a joyous moment for Parents, Godparents, and the entire Church community! We welcome your child and promise to help parents and godparents to be with her/him in the journey to the Kingdom of Heaven. 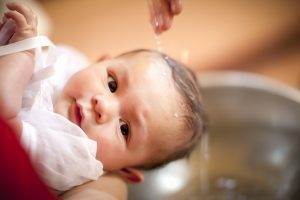 Baptism Preparation for Infants: In expressing a desire to have their child baptized, parents are accepting the responsibility of raising their child in the Catholic faith. To assist parents in their duty as Christian parents to raise their children in the ways of faith, the church requires all parents be registered members of the parish and to attend baptismal preparation classes prior to scheduling the baptism of their children.